Looking for a tasty appetizer to bring to the backyard cookout? 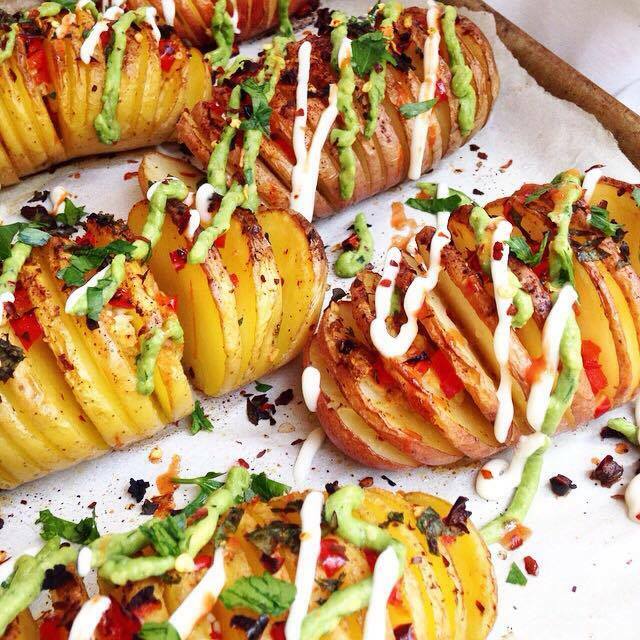 This baked potato recipe is packed with flavour, looks amazing, and is seriously easy to make!... So you'll have everyone fooled, even if you're not a whiz in the kitchen! Step 1: Line baking sheet with parchment paper, and preheat oven to 425 F. Using a cutting board and serrated knife, slice potatoes widthwise, approximately 0.5-1 cm per slice. Be careful not to slice all the way through! Ideally, the potatoes should fan out, or be somewhat easily opened up. Step 2: Place potatoes onto baking sheet; spread out evenly. 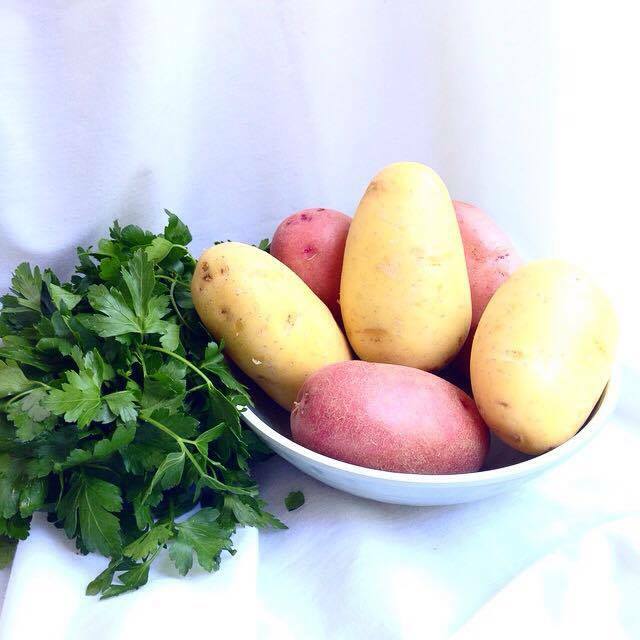 Brush each potato with oil, getting into the sliced creases as much as possible. Brush potatoes with garlic, and begin to fill with cashew cheese, peppers, and cilantro (leave about a teaspoon of cilantro aside for your dressing). Step 3: Top with chilli flakes, chilli powder, salt, and pepper, and place in the oven for 60 minutes. Potato skins should turn golden brown, and slightly crispy when ready. Use a fork to puncture the potato; if will be somewhat soft when ready. Step 4: Using your cutting board, mash your avocado with a fork, then sprinkle lime juice, salt, pepper, and cilantro on top. Mix evenly, and drizzle over potatoes. Lastly, drizzle on hot sauce and veganaise. I used a small sandwich bag to evenly coat the potatoes with sauces, but squeeze bottles work well too when using thicker dressings!